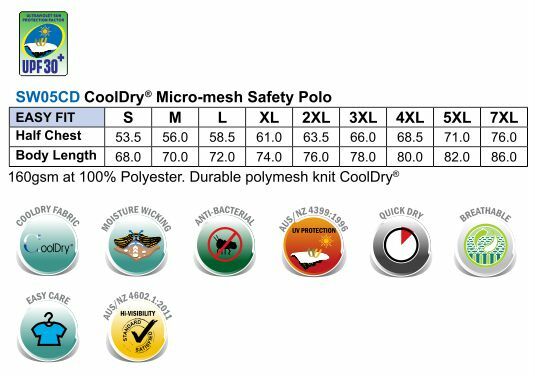 100% poly CoolDry ® Micro-mesh Safety Polo, Conforms to AS/NZS 4602.1:2011 Class D day use safety wear with UV rated. Contrast collar with two stripes. Contrast lower front garment & collar. 100% CoolDry ® Micro-mesh Safety Polo, Conforms to AS/NZS 4602.1:2011 Class D day use safety wear with UV rated. Contrast collar with two stripes. Contrast lower front garment & collar.